I can’t believe its been almost a year since I planted our bare root apple trees! Where has the time gone? And, why haven’t I written about it on here yet? 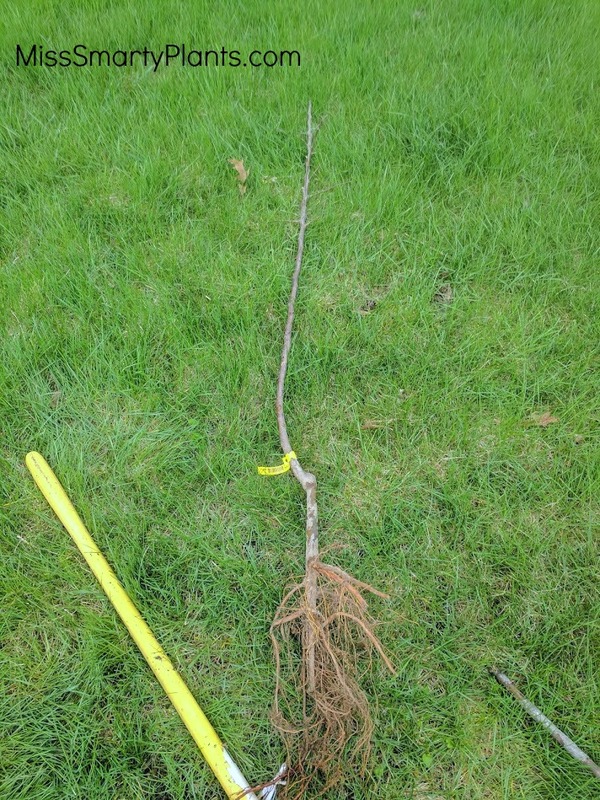 Its been a very busy year but I am glad that I took the time last spring to order and plant three bare root apple trees. 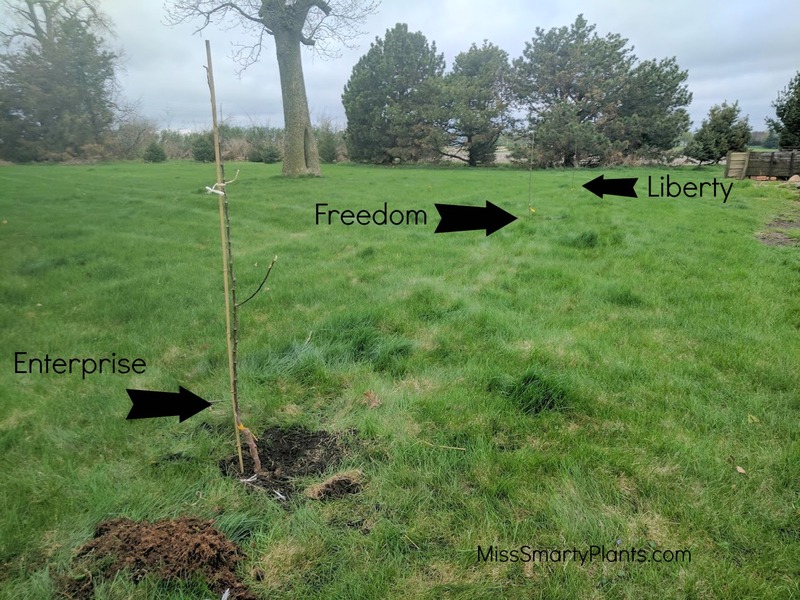 Growing up I remember having two apple trees alongside our driveway and I knew that one way of embracing our new zone 5 growing zone was to plant something that I couldn’t grow in Florida. Apple trees fit that requirement! I started this process by checking out the Iowa State Extension website for variety recommendations. 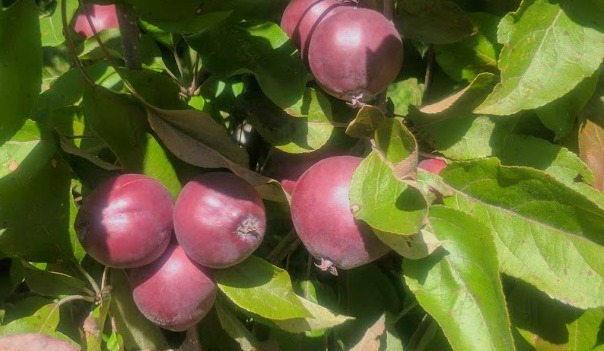 I love looking through plant catalogs and I knew I would be easily distracted by beautiful photos of bright red apples. This publication on Fruit Cultivars for Iowa is my favorite for selecting fruit trees. I decided to go with three different cultivars grown on semi-dwarf root stock. I bought my trees from Stark Brothers online. They had the varieties I wanted and… I was impatient. I knew we were moving to Iowa and I wanted to get these babies planted! I am sure our local nurseries have these varieties too. 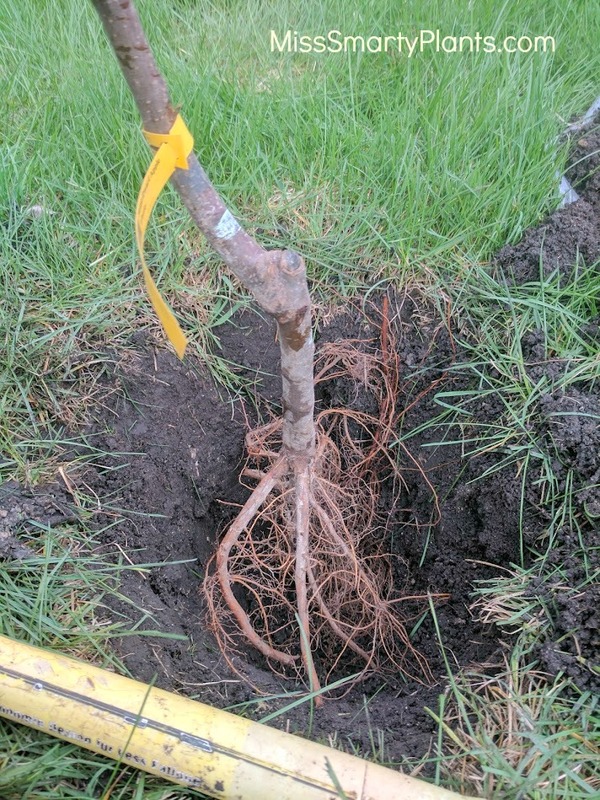 Buying grafted trees allows you to chose the mature size of your fruit trees. Since mine are grafted, there were several choices available. Decide which is right for you based on the amount of room that you have available and also being considerate of picking. Columnar Apple Trees mature to be about 8-10′ tall, but only 18-24″ wide. This makes them perfect for growing in containers on balconies and patios. Dwarf Apple Trees mature to be about 8-10′ tall and wide. Even though they are smaller, they produce an abundance of full-size apples. Semi-Dwarf Apple Trees mature to be about 12-15′ tall and wide. They offer maximum apple yield per square foot. Standard Apple Trees mature to be about 15-25′ tall and 20′ wide. They are perfect if you have a large space or want a multi-purpose apple & shade tree. I began by marking the location of my trees. I wanted them equally spaced and even though they don’t look like much now, I think this row of trees will be beautiful in the future. Since this area was in grass, I started by removing about an 18″ circle of sod and soil to create a large hole. Once I had the tree setting in there I could adjust to make sure the roots were spread out and also that the depth was correct. 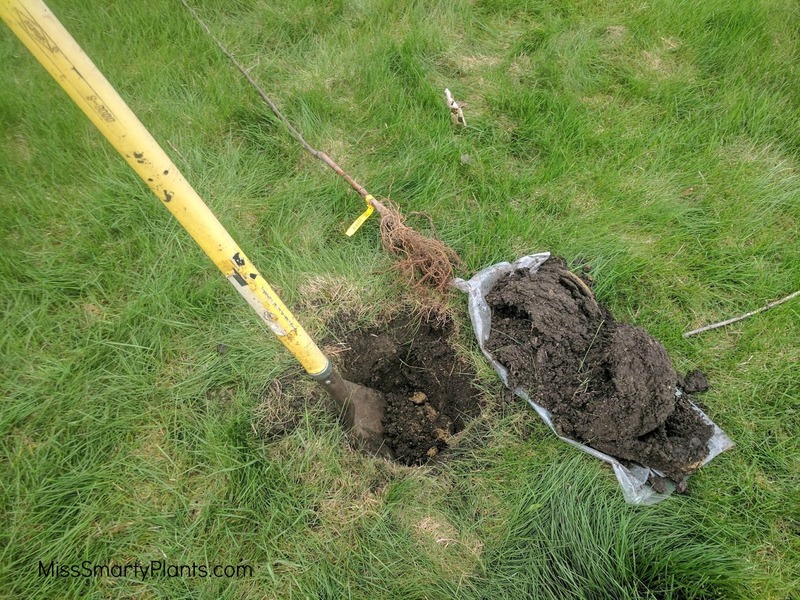 The beauty of planting bare root apple trees is that they are very easy to work with and this task can easily be done alone. I did add some flags and small stakes to my trees to keep them upright while they established. Just yesterday I took the photo below and removed the small stakes. 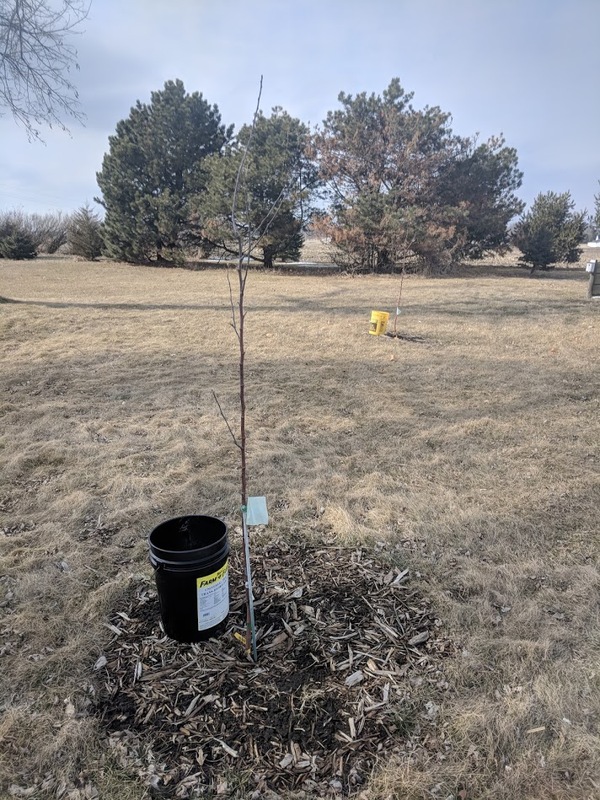 Its amazing, but the process of bending and moving in the wind will actually make these apple trees stronger in the long run. I like to think of stakes as being similar to an ankle brace; you need the brace to start feeling better, but if you continue to wear it all of the time your ankle will not get stronger because the brace is doing the work. I think one year is a good rule of thumb for the amount of time to leave a stake on a tree. You can see that I did increase the ring of grass-free space around each tree. The buckets that are shown are my “slow release” watering system. I have small holes drilled in the bottom of each so that when I am watering I can just fill them and move on to the next and yet it will water the tree slowly and deeply.